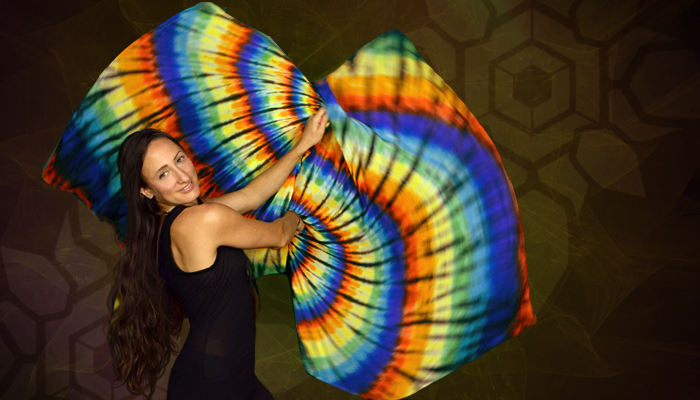 We are stoked to bring you an expanding line of inspiring day props to help you find your flow. You don't need to wait for sunset to start playing and practicing. Flowtoys day props are custom designed to surround you with rainbows, glittering light and playful joy under the sun. Joyful rainbow fuzzy poi are the perfect way to begin any poi journey, while custom exclusive glitterbomb contact poi sparkle like no other. We currently offer 2 sets of beautiful handmade silk flags, and will be adding silk fans and rainbow ribbons soon. Stay tuned! Not nocturnal? No worries - you can play all day and save with these discounted bundles of daytime flowtoys. The flow awakens! Feel your flow with the new windsinger - move, wave, dance and wield this cool new prop to feel a sonic sensation like no other. Made by our friends at OmWand, the windsinger sounds super cool, and feels amazing to play with alone or as pair. It's the lightsaber's sonic sister! Get the double windsinger special - combining 2 windsingers with the windsinger connector and wield a super sweet double-ended windsinger staff for twice the wubs! Welcome to the original toroflux! Get a multipack to share with your friends and family - 6 for the price of 5 - everyone loves them! Get your genuine toroflux from Flowtoys - don't be fooled by imitators!